5. Approximately one in three babies in the United States is now delivered by cesarean section. The number of cesarean sections in the United States has risen 46% since 1996. 6. Approximately 15–25% of recognized pregnancies end in miscarriage. However, many miscarriages often occur before a woman even knows she is pregnant. 7. Fewer than 10% of babies are born on their exact due dates, 50% are born within 1 week of the due date, and 90% are born within 2 weeks of the date. 8. During pregnancy, a woman is more likely to experience bleeding gums and nosebleeds caused by hormonal changes that increase blood flow to the mouth and nose. 9. Approximately 70% of expectant mothers report experiencing some symptoms of morning sickness during the first trimester of pregnancy. 10. Pregnant women usually experience a heightened sense of smell beginning late in the first trimester. Some experts call this the body’s way of protecting a pregnant woman from foods that are unsafe for the fetus. Bonus: According to research, pregnant women tend to eat more if carrying a baby boy. 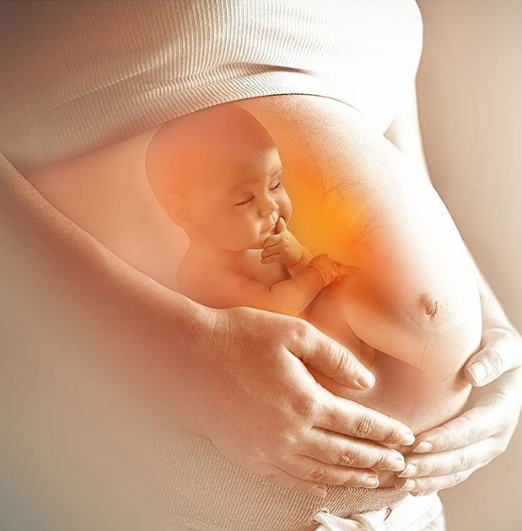 Male fetuses may secrete a chemical that stimulates their mothers to step up her energy intake.